As a young African woman arrives in Paris and walks past two men, one French and one African, the men admire her beauty and fantasize. The European man dreams of taking the woman out for dinner in a restaurant while the African man imagines the woman preparing him a meal at home. Through their dreams, both men reflect the ways in which their differing cultural backgrounds impact their interactions with women. Foster, Gwendolyn Audrey. “Safi Faye: Ethnographic Films And Questions Of Subjectivity.” Popular Culture Review9.2 (1998): 19-29. MLA International Bibliography. Web. 8 May 2014. Marker, Cynthia. “Safi Faye and Sarah Maldoror: Cinécrivaines of African Cinema.” The Journal of Twentieth-Century/Contemporary French Studies 4.2 (2000): 453-69.Web of Science. Web. 14 Apr. 2014. Reid, Mark A. 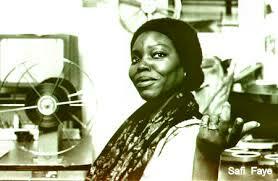 “Dialogic Modes of Representing Africa(s): Womanist Film.” Black American Literature Forum 25.2 (1991): 375-88. JSTOR. Web. 14 Apr. 2014.